Margo Euler is celebrating her 43rd season as Music Director of The Broad Cove Chorale and her 40th season as Music Director of the Unicorn Singers. Raised and educated in Wellesley, MA, she holds degrees from Smith College and the Harvard Graduate School of Education. Before moving to the South Shore, she taught elementary school music in Concord, MA and conducted the Concord Madrigals, a women's chorus, for 14 years. An enthusiastic and long-time member of the American Choral Directors Association (ACDA), Margo has served the MA chapter as resource person for Women's Choirs. She has served on the MA Arts Council and the Hingham Arts Lottery Council, and was instrumental in the creation of festivals showcasing four area women's choruses at UMass Boston in 1988 and at Harvard University in 1991. She has also served as Music Director for several area theatre groups, including the Hingham Civic Music Theatre, where she prepared and conducted several shows including its highly acclaimed production of Evita. A passionate choral singer, Margo gives full credit to the legendary Iva Dee Hiatt at Smith College as the model for her career choice, for the firm foundation in technique she acquired during her education, and for the management experience that led her to want to run her organization as well as conduct the music it performs. Margo looks back on performances at Lincoln Center with Robert Shaw in the Mostly Mozart Festival; Haydn's "Creation" with John Nelson at the Aspen Choral Festival; Brubeck's Mass, "To Hope! A Celebration," sung at the Berkshire Choral Festival with Dave Brubeck at the piano; and her 16 summers singing at Ogontz Camp in New Hampshire's White Mountains with Sir David Willcocks, Richard Marlowe, and David Hill as highlights of her long singing career. Read the Patriot Ledger feature article to learn more about Margo. Lenae Badger, a Florida native, received her Bachelor of Music (organ principal) from Stetson University in Deland, Florida, where she also studied voice and was an active recital accompanist. Lenae received her Masters of Music in 1981 from Yale's Institute of Sacred Music. She is currently Minister of Music at House of Prayer Lutheran Church in Hingham, and teaches piano and voice in her Scituate home. Lenae accompanies and sings with both the Unicorn Singers and Broad Cove Chorale in rehearsals and performances and is often a vocal soloist with both groups. Rich Jensen began choral singing as a member of the Yale Glee Club. He has been arranging popular music, folk songs, and Broadway selections for the Unicorn Singers and Broad Cove Chorale for many years and has had pieces performed by the Oriana Consort of Cambridge and other area groups. Rich is the musical director of Crossroads, a small, mixed ensemble that has performed "Measured Passage," a program of his arrangements, musical settings, and original songs, at several South Shore venues and that is a musical fixture at Old Ship Church's annual winter solstice poetry reading. Rich is happy to share his arrangements and compositions with other choruses; he welcomes inquiries at rajensen88@hotmail.com. Bob Ruplenas received his Bachelor of Music degree from the University of Massachusetts, where he studied theory with Frederick Tillis, Robert Stern, and Charles Fussell, and conducting with Richard duBois. Bob has taught in the public schools of West Springfield and Somerville, Massachusetts. He has also served as choir director at Fisk Memorial United Methodist Church in Natick, MA and conducted the chamber choir Cantemus. Bob's choral compositions have been performed at several churches and by community choruses in the metropolitan Boston region. In 2008 Cantemus commissioned Bob to write "A Millay Set: 5 poems of Edna St. Vincent Millay" in commemoration of the choir's 25th anniversary. His "A Bitter Suite: 5 poems of Dorothy Parker" was recently premiered by the Broad Cove Chorale. His anthem "What is this Goodly Fragrance" was published by Abingdon Press, and his "Choral Anthem on Beach Spring" is under arrangement with Paraclete Press. Trained as a singer, Bob performed for many years with the Tanglewood Festival Chorus and the John Oliver Chorale. Joan Gatturna has worked as a professional writer and storyteller for the last 30 years. A longtime Hingham resident who recently moved to Duxbury, she originally came to Boston from her native Connecticut to earn an MS in library science at Simmons College. After 15 years working as a librarian in such communities as Boston, Duxbury, and Cohasset and one year spent serving as Education Director at Boston's Old South Meeting House, Joan decided to focus her professional research abilities on developing educational storytelling about "Amazing American Women." For the next 30 years, she presented her programs widely on the East Coast, including at the Museum of Fine Arts Boston, at the Old South Meeting House in Boston as part of the WGBH Forum Series, throughout New Hampshire under the auspices of the Humanities To Go program, and at the National Archives in Washington DC. Joan still occasionally appears at the Paul Revere House in Boston as Mrs. Paul Revere in a program entitled "The Other Side of the Midnight Ride." Gatturna has sung with the Unicorn Singers for 26 years and is thrilled to be able to combine her storytelling experience with the music of this talented group. 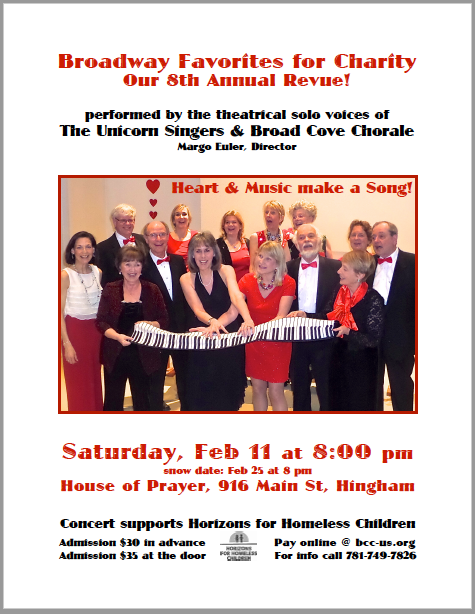 The Broad Cove Chorale Unicorn Singers, Inc. (BCC-US) of the South Shore of Massachusetts is a non-profit organization and community of volunteer choral singers who are musically experienced and deeply committed to the core values of artistic excellence and community enrichment. Two separate choirs, The Broad Cove Chorale and The Unicorn Singers, form the BCC-US. The Broad Cove Chorale is a women's chorus. The Unicorn Singers is a mixed chorus. Both groups are chamber choirs of approximately 20 members each. 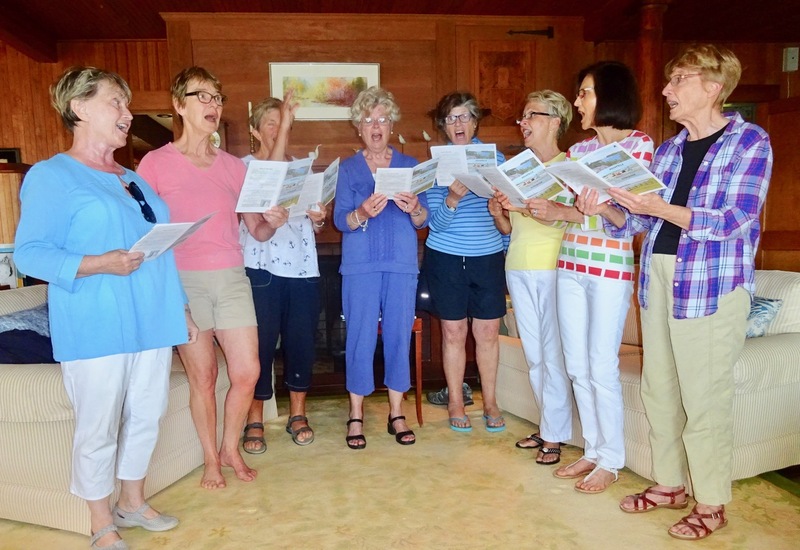 The Broad Cove Chorale was founded by Margo Euler in 1975 when she moved with her family from Concord, MA to history-filled Broad Cove House in Hingham. Margo's first priority upon taking up residence in this house built by one of Abraham Lincoln's ancestors was to check out the acoustics in the large music room that had been added to the original house in 1927. On a warm May morning, she brought her Concord Madrigals to perform a benefit concert for the South Shore Conservatory; before the end of the reception that followed, a number of local women had signed up to form a South Shore version of what they had just heard. The group is now more than 40 years old. Three years later, in 1978, the women of the Broad Cove Chorale decided to invite men to join them for a production of Menotti's madrigal-ballet The Unicorn, The Gorgon, and the Manticore. After six successful performances, the mixed group of singers decided to continue as an official chorus, which they named for the musical work that had brought them together. 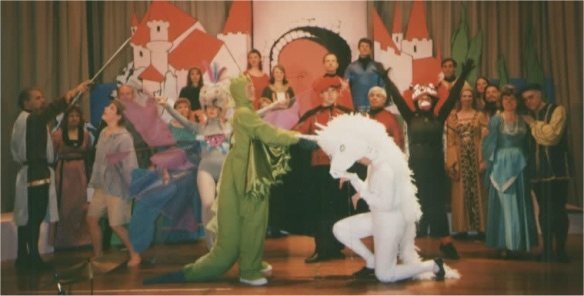 Further strengthening their association with this unique piece, the Unicorn Singers have performed it twice since, on the occasions of both their tenth and twentieth anniversaries. Over the years, the groups have performed in a wide variety of locations around the South Shore and Boston, including the Gardner Museum, the Fogg Art Museum, the Duxbury Arts Complex, the South Shore Music Circus, and many area churches. The Unicorn Singers have been hired for weddings, fund-raisers, and private celebrations. The Broad Cove Chorale has volunteered its musical energies to schools, retirement homes, gatherings of senior citizens, and club meetings, as well as for weddings and other private engagements. Both groups continue to evolve over time, reflecting the creative energies, musical talents, dramatic/literary abilities, and volunteer/community service commitments of their present memberships. The BCC-US season is designed to enrich community both musically and socially; artistic excellence is critical to commitment to community. The first is the community of BCC-US singers. In addition to cultivating their artistic excellence as choral singers, Margo Euler encourages their musical growth and artistic participation more generally. All soloists and small group singers are drawn from the groups, and singers who are proficient instrumentalists sometimes accompany their fellow singers in particular musical pieces. Singers' suggestions for future repertoire are welcome, and concerts regularly include compositions and arrangements by group members. These diverse opportunities to contribute artistically enhance singers' creativity and commitment to the groups. The second is the South Shore audience community who attend concerts of the Broad Cove Chorale and Unicorn Singers. 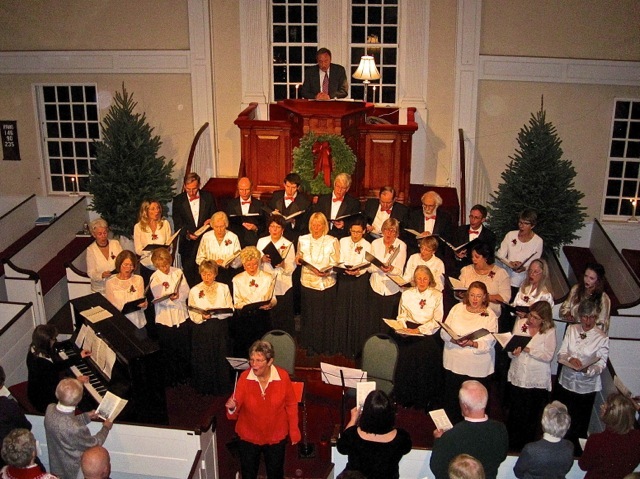 BCC-US singers hail from many Massachusetts South Shore communities, including Cohasset, Duxbury, Hingham, Norwell, Plympton, Scituate, and Weymouth, and so do the members of their audience. Programs aim to inspire listeners to engage fully with both new works and more familiar ones; one concert a year invites audience members to sing along-and they do! At the receptions following some performances, audience members and singers share with one another their enthusiasm for music. The third is the professional musical community within and beyond Massachusetts. Other choirs have performed compositions and arrangements by Bob Ruplenas and Rich Jensen; some have presented whole thematic concert programs originated by BCC-US. In 2015, Margo Euler and Joan Gatturna presented a workshop about processes for creating concerts with storylines and the role of the spoken word in supporting and enhancing singers' and audiences' experiences of music. Their workshop featured "All is Calm, All is Bright," the BCC-US 2014 Christmas concert, which has since been performed by two other Massachusetts choral organizations. As engaged citizens who care about the welfare of their fellow community members, the memberships of BCC-US are pleased to use their musical talents to benefit organizations that provide various kinds of support to individuals and families who need it. The proceeds from the annual Christmas concert and the February Broadway Review are donated to Wellspring Multi-Service Center, Inc. in Hull and Horizons for Homeless Children in Boston, respectively. Performances, often voluntary, at area nursing homes, senior living facilities, and hospitals, provide those who cannot travel to evening cultural events with the opportunity to participate in social/musical community. Members of BCC-US take pride in their musical and non-musical commitments to community. Donations made to BCC-US make it possible for the groups to donate a significant amount of ticket sales proceeds to charities that promote the health and well-being of the South Shore and Greater Boston communities.